Full-page ad from 22 September 2016 edition of The New York Times. Journalist Max Blumenthal tweeted this photo of what he calls an “explicitly racist and quintessentially liberal Zionist full-page ad” in Thursday’s New York Times. It raises fears that within a few years – if it hasn’t occurred already – Palestinians will outnumber Jews in historic Palestine. It may well be part of the ongoing campaign to persuade US President Barack Obama to back a UN Security Council resolution endorsing the so-called two-state solution and abrogating basic Palestinian rights before he leaves office in January. A Hillary Clinton surrogate, Wexler testified before the Democratic Party’s platform drafting committee earlier this year, arguing against including the word “occupation” to describe the present relationship between Israelis and Palestinians. The same segregationist logic also appears this week in an article in Israeli media by the EU’s ambassador to Israel Lars Faaborg-Andersen. This echoes long-standing claims that Palestinians constitute a “demographic threat” to Israel. What it boils down to is that the very existence of Palestinians, the very birth of their babies, violates Israel’s claimed “right” to have a specific ethno-religious composition. In any other context, a person calling themselves a liberal would starkly reject such odious racism, just as mainstream liberals reject Republican presidential nominee Donald Trump’s blanket assertions about various populations perceived as being non-white. But good liberals saw through the racist ruse of the bantustans. The ad also echoes the infamous “separate but equal” language that American white supremacists used to justify Jim Crow and segregation. What does it mean to Palestinians for Israel to be and remain a Jewish majority state? The Jewish majority liberal Zionists seek to protect was engineered through systematic ethnic cleansing starting in 1947-48, followed by racist and discriminatory policies for the last seven decades. This is why Israel cannot exist as a “Jewish state” without violating the rights of all Palestinians to varying degrees. To maintain its Jewish majority and “Jewish democracy,” Israel curtails the rights of millions of Palestinians, including Palestinian citizens of Israel, Palestinians besieged and ghettoized in the West Bank and Gaza Strip and Palestinian refugees denied their right of return solely because they are not Jewish. Israel’s siege and repeated massacres in Gaza are at the extreme end of the spectrum of abuses necessary to maintain Jewish majority rule, but they are an essential part of the same continuum that requires employment and housing discrimination against Palestinian citizens of Israel and outright land theft and ethnic cleansing in the Naqab (Negev). While stark in its racism, The New York Times ad should nonetheless be welcomed as a clear admission that the so-called two-state solution has nothing to do with peace or justice. The S. Daniel Abraham Center for Middle East Peace website carries the ad in its entirety. I was about to copy and paste it here, thinking a second look at the text in an enlarged format would offer more information than Max's tweet photo. But there's nothing further to be gleaned: it's a crude, simply worded appeal to racial panic. There's a peculiar emptiness to the page, with no attempt at argument or engagement with competing views. The disheartening message is that secondary crimes (the Occupation) must be sacrificed to preserve fundamental ones (a racist state). Of course, the notion that this "separation" will entail freedom and dignity for Palestinians doesn't even enter the equation. Analogies with apartheid South Africa and Jim Crow USA are entirely apposite. The moral demand of Zionism, to live apart from the people it dominates, mark this mentality as both debasing and debased. In publishing such an ad, the New York Times has again lived down to its reputation as a receptacle for the grubbiest forms of hasbara. was always premised on the non-existence of Palestinians. This idea was enforced by conquest, murder, dispossession. Otherwise, "it will be too late." The arrogance of the Israeli leadership, funded by the ursurpation of US taxpayer dollars , highlights the evil only money can buy. Israel and its historic twin, apartheid South Africa, found survival in the continued bogus assertions that they are the beacon of "civilization" in a hostile world. That falsehood has diminished ,in today's world, considering the access to information that the world's public has. The ad's tone clearly suggests panic, thankfully so, yet all the while it has an undertone intended to keep open the pockets and pocketbooks of US citizens and the US Treasury. Shameful. Keep up the struggle . Every second of everyday ,Israel's dedication to atrocities just fuels more determination to end Zionism. And this injustice WILL end. I know apartheid when I see it. I should know, I'm South African. 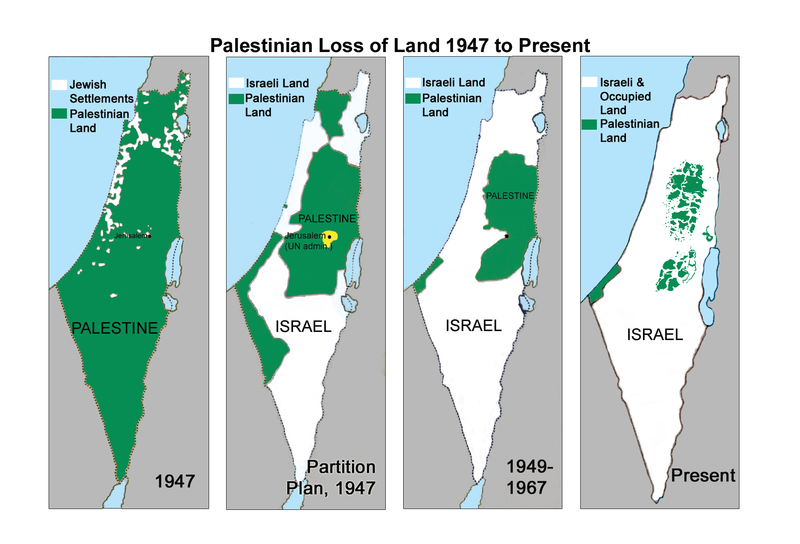 When I see how Israel treats Palestine I see it for what it is: APARTHEID, plain and simple. History shows us that a non Jewish majority is nothing to fear. Jews have lived peacefully as a minority in North Africa and the Middle East for centuries. What the Zionist regime fear is a backlash resulting from the horrendous crimes they commit. They have created a living hell and see no way out other than to keep perpetuating it. In concurrence with Peter, a complete disarmament of the Zionist regime would be a necessary prerequisite for any peace. Zionism is an aggressive ideology that needs to be checked for the safety of humanity. Note that the caption says "Israelis and Palestinians", while the text says "half-Jewish and half-Arab". Conflating 'Israeli' and 'Jew' is antisemitic. #BDS against Apartheid. A special appreciation to commenters---John A. El-Amin, "Sunny"
"Rel" and David Brown for your support. I'm more than old enough to know that when Zionists beg for the two-state solution, it's more than high time for the one-state solution. Sort of curious to know what drugs they're routinely downing at the NYT these days to be printing this nonsense. And here my question: Has anyone currently in charge at the NYT ever read a history book (about any part of the world, in any period)? Does anyone at the NYT think you are going to get away with this, historically speaking? try to analyse what exactly they are attempting? convince the ICC they are bona fide wanting 2 state? seems bit late for that but might sway someone they think important??? Especially as a full page ad in the New York Times.